Grodd has stripped Barry Allen of his powers. All of Central City has been frozen in a moment of time as Grodd continues to take increasing control of the Speed Force, and if he succeeds everyone in Central City will die! Barry is on a desperate hunt for a way to regain his powers…so desperate that he has freed Godspeed from Iron Heights! All of this is coming to a head as we reach Part Four of the “Perfect Storm” arc. Can Barry regain his powers? Will he alienate the entire Flash family in the attempt? And, can anyone stop Grodd? Want to find out more? Follow us after the jump! Barry just won’t listen to good advice, not in this arc. Everyone he knows, from Wally to, uh, Wally, to Godspeed is telling Barry that he can’t do this alone. They know that Grodd is manipulating Barry, and that his attempt to regain his powers cannot possibly end well. Still, Grodd has tapped into Barry Allen’s greatest secret…that he truly believes he is nothing, absolutely nothing without his powers. That brings us to this chapter of THE FLASH. While Wally fights and defeats Raijin, young Wally and Avery try to get through to Meena. Raijin is no match for the older Wally…but Meena is too much of a match for young Wally and Avery. Meena has no intention of turning against Grodd, and only the late arrival of Godspeed and Barry prevents her from killing them both. Yes, Barry has brought the lightning rod, against the advice of…well, everyone. He truly believes that no other speedster or combination of speedsters can stop Grodd. Only Barry can, or so he thinks, so he uses that lightning rod to reclaim his powers. Good news: Barry is once again the Fastest Man Alive! Bad news: He has played right into Grodd’s hands! The lightning rod may have helped Barry, but it also increased Grodd’s connection to the Speed Force. Grodd now controls…everyone except Barry himself. That means Grodd now controls…both Wallys, Avery, Godspeed…everyone! And, he has turned them all against Barry Allen! As an arc, Perfect Storm has been fantastic. We see a revitalized Gorilla Grodd, a terrific series of battles, and an amazing amount of dramatic tension as Barry’s instincts lead him in exactly the wrong pathway. If this is what we mean by the lead-up to Flash War, I’m in. My only quibble is what all of this has done to Barry as a character. Barry has always seemed more selfless than this (think sacrificing himself to save the universe in the original Crisis on Infinite Earths). Now, he has become somewhat selfish and definitely over-the-top stubborn in his single-minded “I’m the only one who can” mentality. After all, he had not one but FOUR speedsters ready to help him, and he wouldn’t accept their help or even listen to their pleas that he was heading in the wrong direction. I’m hoping the resolution to this arc will give Barry a better direction. I do have hope for that, and I believe that hope is well-founded as writer Joshua Williamson has had a great handle on the character of Barry Allen…I’m just hoping that better direction comes soon. The artwork by Dan Panosian (colors by Hi-Fi) is great throughout, with some creative page layouts, terrific action sequences, and excellent emotional expression. Overall, I’d give this one an 8/10. But, that’s just my opinion. What do YOU think? Leave your comments below! 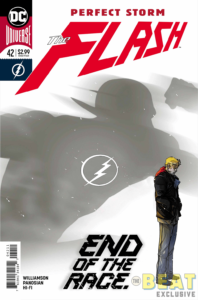 This entry was posted in Reviews and tagged Avery, Barry Allen, Godspeed, Gorilla Grod, Grodd, Kid Flash, Review, The Flash, The Flash of China, Wally West on March 14, 2018 by Ed Garrett.